You are currently browsing the archives for February, 2009. Hi. I’ll have 8 oz of the free-range–no-antibiotics–natural–no-artificial-growth-hormone–happy-cow steak. No; not that one, the one behind it and to the right, please. Sound familiar? It’s sad that the barriers between industrialization and gastronomy have been breached, but it’s the truth. After reading Michael Pollen’s Omnivore’s Dilema, I’m scared, or rather disgusted, to buy any other meat. I’ll usually pass on the massaged cattle lavished with all-they-can-drink sake, unless the parents are paying, and simply go for the healthy, happy cow instead. Slightly more expensive than the hormone-injected alternative, but I make it stretch to fit the occasion. If it’s dinner for two, I’ll break open a bottle of wine and enjoy a nice steak perhaps alongside some pureed parsnips or celery root. If it’s for a party, I’ll serve it as an appetizer and share it with my guests. 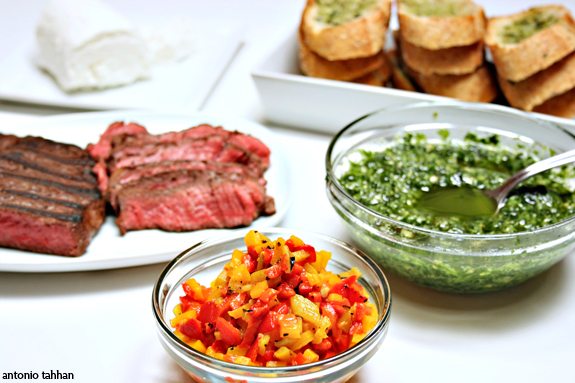 Steak crostini with parsley pesto and goat cheese is an appetizer I came up with while in college. I was invited to a dinner party and was expected to bring something grand – usually what happens when friends find out you like to cook. I had to strike a balance though: too fancy and I would’ve been thought of as showing off; too simple and I would’ve risked disappointment. A good quality steak can do wonders if executed properly. Once your meat leaves the butcher, it becomes your responsibility. Season it well, let it sit at room temperature before cooking, don’t over cook it, and allow it to rest before slicing. 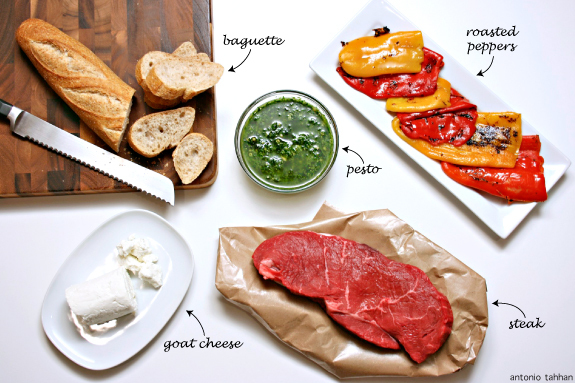 These four points along with some good judgement can go a long way when preparing meat. I originally made this dish with regular pesto because that was one of the things I had in my fridge before the party. In retrospect it was passable, but a bit too overpowering for the steak. I tried it again by pulsing parsley into my pesto and it was wonderful. You get a slight herbal note from the basil, but at the same time you’re greeted with a clean, crisp flavor from the parsley. I used a whole wheat baguette when I made the appetizer last night and thought it was fantastic. This was also not part of the original dish, but I felt that it added an appealing nutty component to the crostini. On a side note, we’ve really come a long way in terms of whole wheat products – they don’t taste like cardboard anymore. 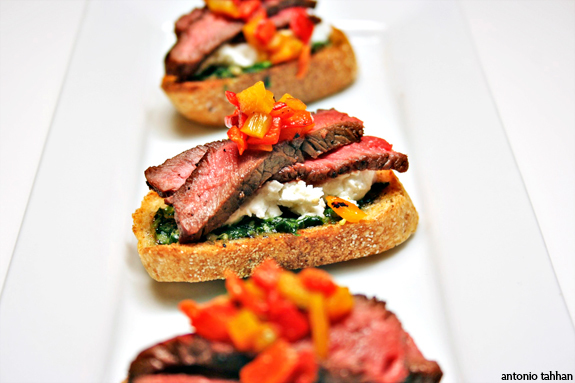 The reason why I added two thin slices of steak to each appetizer as opposed to one thicker slice is because it makes the crostini easier to eat. If you’re serving this at a party, you definitely don’t want your guests struggling with a big hunk of meat while they’re mingling and sipping on cocktails. 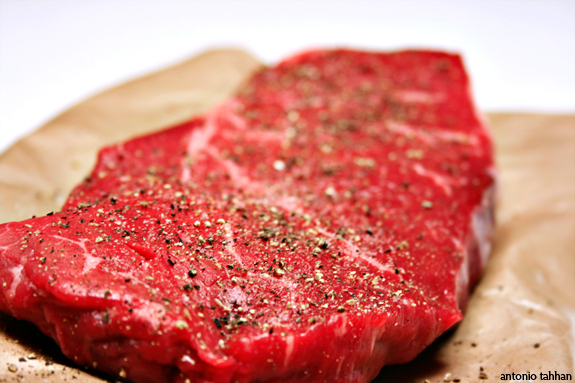 Allow steak to sit at room temperature for 5-10 minutes. Season with salt & pepper and sear for 3-4 minutes on each side, until medium rare. Allow meat to rest before slicing. Slice the baguette on a (~1/4 in slices), brush with some of the basil oil and broil until golden brown. 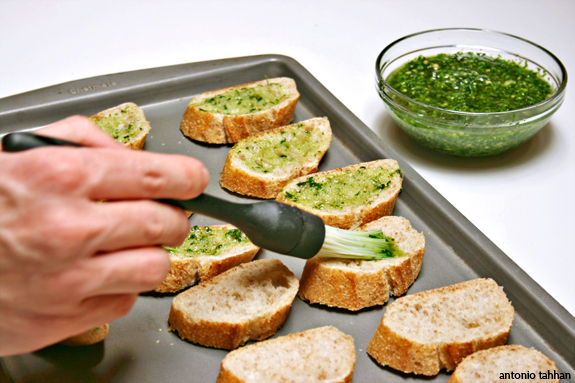 Once all the components are ready start by smearing a little more pesto on the toasted baguette slices. Top with a little goat cheese and two thin slices of the steak. 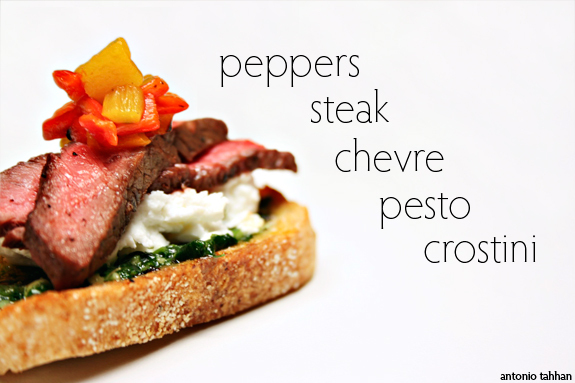 Garnish with diced roasted peppers. note: To make your own parsley pesto simply replace some of the basil with parsley in your favorite pesto recipe or pulse some parsley into some high quality store bought pesto and call it a day. During the month of January, A Taste of the Mediterranean was all about the ubiquitous French tart. Crispy, buttery, but not always sweet; the challenge was to create your spin, either sweet or savory, on this classic French pastry. The winner for January is Maggie from Dog Hill Kitchen with her Vegan Orange Cream Tarts with Almond Crusts! Congrats Maggie! You could check out her entry and all the other tart entries here. This month we’re hopping from France over to the Greek islands with Peter from Kalofagas. For those (very few) who don’t know who Peter is, well, he’s a gifted Greek blogger who lives in Canada and who, I’m convinced, knows everything there is to know about Greek food. He’s the host this month for the A Taste of the Mediterranean contest and he’s calling on bloggers to make their own twists on the classic Greek pastitsio. To kick off the contest I decided to make my variation of this Greek lasagna using as many flavors from around the Mediterranean as I could. The classic recipe for pastitsio calls for meat sauce and bechamel spread between layers pasta. For my variation I incorporated Fontina cheese from Italy, red wine from France and harissa paste from Northern Africa, mainly because I had those ingredients laying around, but also because I enjoy mixing complimentary flavors from different regions of the Mediterranean. The first thing I did was get my meat sauce going. 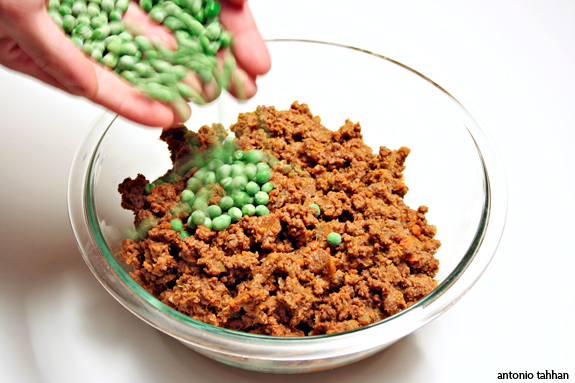 It’s extremely easy, but takes time for the flavors to develop and turn into a proper meat sauce. 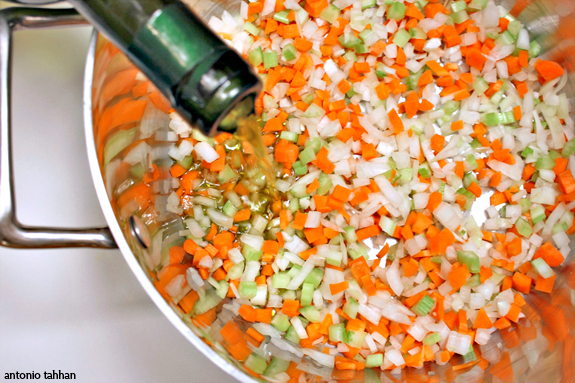 The sauce starts with the classic mirapoux (i.e. the trinity) of carrots, celery and onions. The key is to cook them over medium heat so that they become soft, but it is important they don’t caramelize. I decided to go into full-on Greek mode for this recipe. This means I took no short cuts and made sure to multiply the recipe by three. I then stored two pans of the pastitsio in the freezer ready to go for those days when the bachelor in me wants food to magically appear on the table without chopping an onion or stirring a pot. 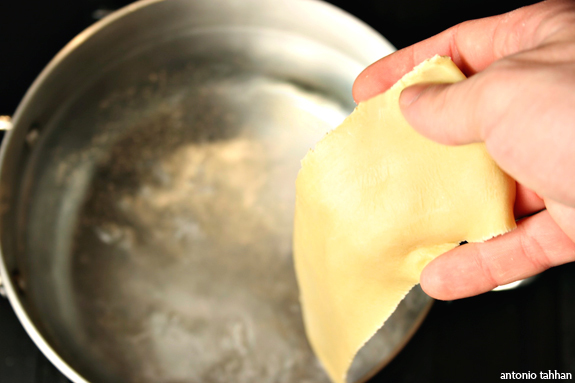 Once you’re done rolling out the dough, all the pasta needs is a quick bath in boiling water. 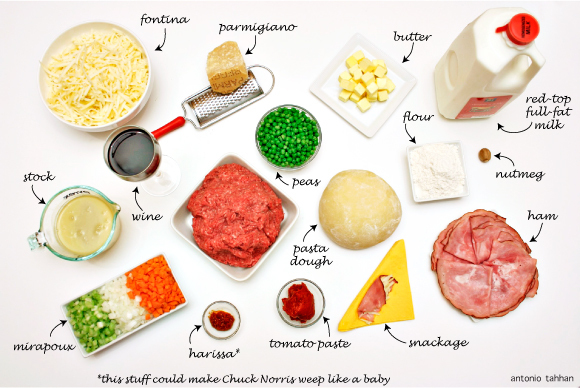 You don’t want to cook it all the way though… this is just to give it a head start. Once the pasta boils for 1-2 minutes, shock it in an ice bath to immediately stop the cooking process. The pasta will then finish cooking with the rest of the ingredients in the oven. Once the meat sauce is done cooking, you’ll be happy. Your entire kitchen will acquire the aroma of the meat sauce and you’ll find yourself in the tasting stage, wondering if there is anything missing. Perhaps a little more salt and pepper might be good? Sometimes that helps, but often the addition of anything fresh and green will strike a balance with the rich flavors of the sauce. I used frozen petite peas for this because they’re green, but also because they have a creamy bite to them that I enjoy. The layering is up to you and mostly depends on the ingredients you use and your own personal preferences. I always start with a thin layer of bechamel on a buttered pan because that helps prevent sticking. From there I start by layering pasta, more bechamel, meat, cheese, ham, even more bechamel and then pasta again. I do this until I reach the very top, which I finish off with a little more bechamel, a sprinkling of fontina cheese and a thin layer of parmigiano reggianno on the very top to develop a nice crust in the oven. This was my humble recreation of Greek pastitsio done alla Mediterranean. It was my dinner last night, tonight and it will probably be my dinner for a few more nights this week. I can’t wait to see other variations of this dish for A Taste of the Mediterranean! 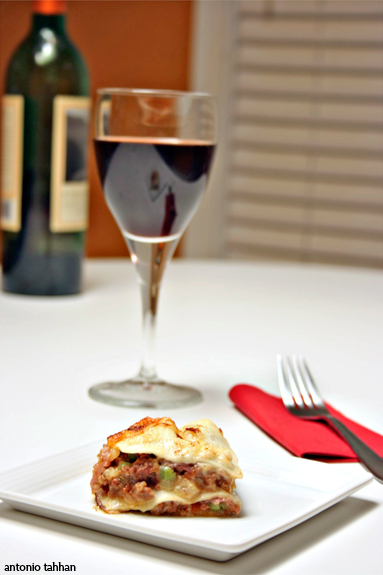 Remember that the winning pastitsio post will win a $50 gift certificate to iGourmet! Prepare all the components to the pastitsio and set aside for assembly. Preheat oven to 400 degrees and butter a 9×13 baking pan. Begin by adding a thin layer of bechamel to the bottom of the pan. 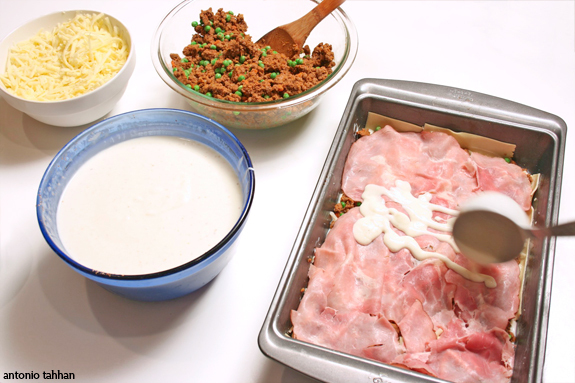 Follow with a layer of pasta, a layer of bechamel, a layer of meat mixture, a layer of ham, and a sprinkling of fontina. Repeat until you reach the top of the pan (usually 2-3 layers of meat). Top the final layer of pasta with a final thin layer of bechamel, a thin layer of fontina and finish off with parmesan cheese. Bake covered for 30 minutes and uncovered for the last 15 (broil for a couple minutes at the end if you want an extra crispy crust). 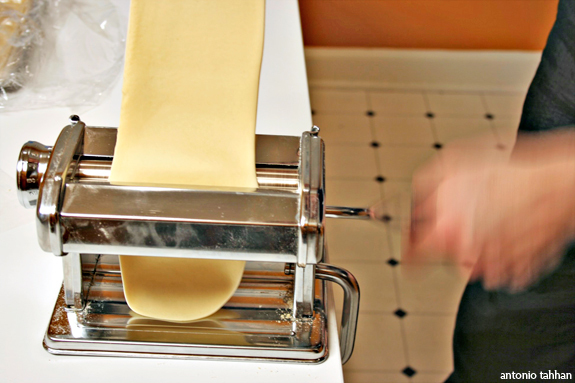 note: You can make your own pasta dough or use the dry lasagna sheets available at your local supermarket. It’s almost February, it’s cold and it’s the perfect time for soup, if there ever was one. Keeping true to my kibbeh promise from my last post, I made kibbeh b’laban (كبة بلبن او كبة لبنية), which literally translated means kibbeh cooked in yogurt. Not only was it my first try at making this on my blog, but it was my first attempt ever. In order to get everything right, I called my sito (grandmother in Arabic) and stayed on the phone with her until I got every last detail of this dish right. It also took a long time since I had to convert her measurements of “handfuls, half-handfuls and pinches” into more relative quantities. All in all, it was lots of fun and in retrospect, a major success. If you want to go for the absolute traditional method, you’ll want to use goat milk yogurt instead of cow’s milk. Although either works fine for this dish. The other main ingredient I want to talk about is the habra, which is basically ground inside round (with absolutely no fat) and then processed in the food processor with some salt, a little ice water and a tiny amount of baking soda. This makes the traditional meat paste used in every kibbeh recipe. I’ll usually prepare kilos of habra at a time and keep 500g portions stored in the freezer for whenever I want to make kibbeh. The meat itself has absolutely no fat, and is mixed with the soaked bulgur wheat to form the outside of the kibbeh balls. For moisture, the kibbeh is stuffed with grated onions and a tiny dab of cold butter. 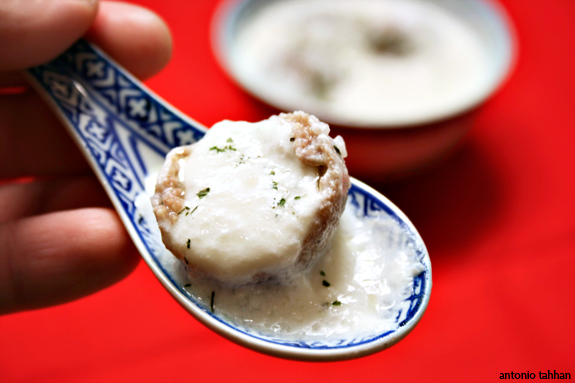 As the kibbeh balls cook in the yogurt, the butter will melt and combine with the grated onions to make for a sweet surprise in each bite. 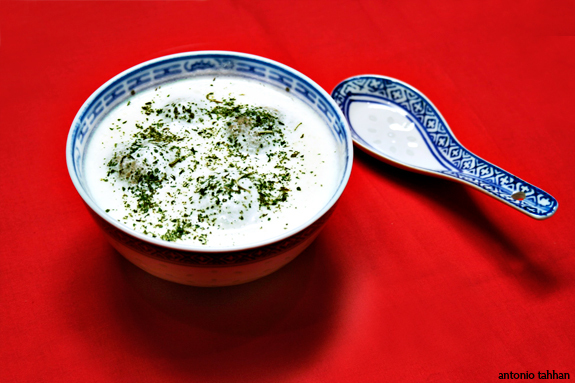 The yogurt is the foundation of the dish and requires some cleverness to avoid it from curdling over the heat. 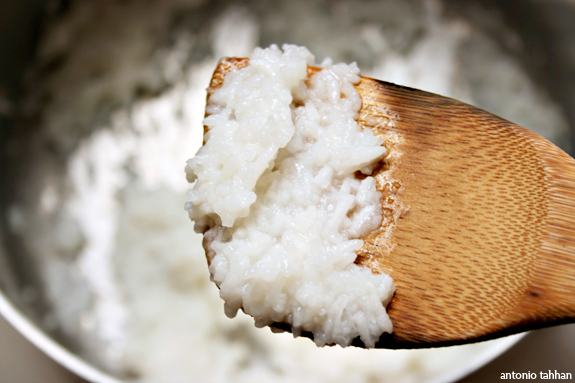 The first step is to cook about a quarter cup of rice in 3/4 to 1 cup of water (way more than you usually need) until it turns into complete mush. Once it cools a bit you’ll want to blend the mushy rice with the yogurt, egg and a teaspoon of cornstarch. The egg, cornstarch and rice all act as stabilizers for the yogurt. A final precaution would be to cook the sauce over low heat and stirring only in one direction (either clockwise or counterclockwise). Don’t ask me why, but it works… if anyone knows a more scientific reason to this, I’d love to know it. Once the yogurt begins to simmer, cook the kibbeh balls in the yogurt at a low simmer for about 7-10 minutes (depending on the size of your kibbeh) and you’ve got a fantastic Middle Eastern soup. Sprinkle with some dried mint and enjoy. Soak the bulgur wheat in water for 10-15 minutes (use enough water to cover the bulgur entirely by about 1/4 inch). Mix habra, allspice and soaked bulgur together and set aside. Cook the rice in 3/4 cup of water until mushy. 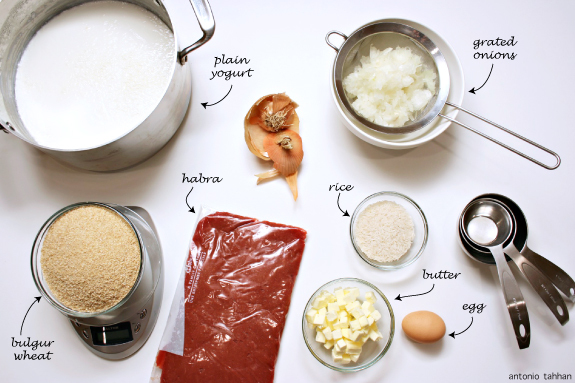 Blend the rice with some of the yogurt, the egg and the cornstarch. Mix this mixture with the rest of yogurt and place over low heat. Stir occasionally and once it comes to a small simmer, add kibbeh balls and cook for another 5-10 minutes (depending on the size of the kibbeh). 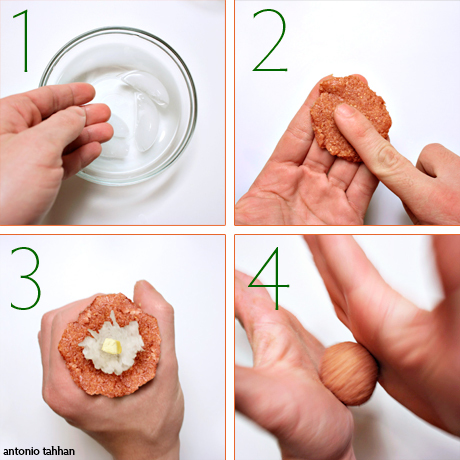 note: use the ice water to form the kibbeh balls. This will help make them smooth. For more specific step-by-step instructions read the blog post.